Fagan Harris is reimagining the changemaker talent pipeline for Baltimore and similar post-industrial cities struggling to recruit and retain top talent. Fagan Harris is reimagining the changemaker talent pipeline for Baltimore and similar post-industrial cities struggling to recruit and retain top talent to solve pressing and increasing complex social problems. Fagan Harris is creating a new talent model for post-industrial cities in the United States. Starting in Baltimore, a city that has struggled with racial inequity and declining opportunity, Fagan’s team recruits and retains diverse professional talent— first by connecting mid-career professionals to high-impact opportunities via funded one-year terms as Baltimore Corps Fellows. And then by making an up-front investment in each Fellow’s social capital, local networks, and accountability to the city. By retaining these leaders beyond their service term, his Baltimore Corps team endeavors to build the next generation of social, political, private, and philanthropic leadership for Baltimore and further catalyze a movement for its renewal. On a parallel track, Fagan is building robust data on social change and re-imagining a distributed citizen sector as an integrated, aligned “team of teams.” By surveying hundreds of leaders and organizations—from the mayor to neighborhood church leaders—his team is developing the city’s first comprehensive mapping of needs and assets across the city, identifying the most promising solutions, and funneling new talent toward them. The new talent, very much including the Fellows and a growing number of alumni, share an operating system and back-office, further wiring them together and strengthening the citizen sector’s ability to respond to complex city-wide challenges, both those of long standing and as they arise or become acute. This is a model open network with the Fellows acting as key nodes. By building a diverse and cooperative network of changemakers, Fagan and his team can elevate the city’s interests above those of any one organization, unlocking new opportunities and drawing in new partners. And not only is the network more effective, but by naming, interrogating and dismantling unjust systems, it is building a more equitable city-wide citizen sector as well. Other organizations and cities are already replicating this model (by hiring city-wide talent chiefs, for example) across post-industrial cities and beyond. 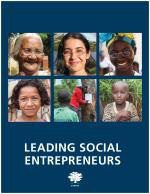 Fagan' s story appears in the 2018 edition of "Leading Social Entrepreneurs" which features a selection of just a few of the Ashoka Fellows recently brought into the largest global network of social entrepreneurs. The LSE presents some of the newest innovations by leading social entrepreneurs whose ideas are changing the way things are done all over the world.